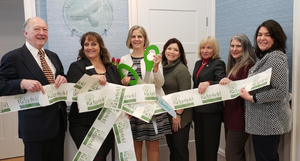 The Ridgefield Chamber of Commerce held a ribbon cutting ceremony to welcome Aquila Tax Solutions CPA LLC as a new member! This full-service CPA firm has served families, family offices and businesses since 1990 and recently opened a new office in Ridgefield. Aquila Tax Solutions’ core services include tax preparation, tax planning and business consulting. Aquila Tax Solutions CPA LLC is located at 4 Prospect Street in Ridgefield. Learn more about their tax preparation and planning services athttps://aquilataxsolutionscpa.com or call (203) 403-3730. Nancy Hogan and staff look forward to meeting you!